August 23, 2012 | Posted by Lee C.
You may have heard the term’ throw’ used to describe what you thought was a blanket, or purchased what you thought was a blanket only to find that it was too small for your bed. While the exact definitions of blankets, throws, and other coverings are still subject to discussion, there are some general guidelines for the terms. A throw is smaller than a blanket. According to eHow Home, it usually comes in one size, about 50 inches by 60 inches. If the size varies greatly from this, it should be indicated on the packaging. Throws have several intended purposes. Often, the primary purpose is decoration. Many throws have beautiful patterns or intricate, tapestry-like designs that can be displayed in a living area. Throws can be draped over couches, chairs, the end of beds, hung on blanket racks or even hung on a wall. Throws are also used to provide warmth and comfort while relaxing on a couch or chair. They are made from a wide variety of materials. Fleece throws are very popular for warmth and comfort. A simple fleece throw can be made by tying together the fringed edges of two pieces of fleece fabric. Detailed instructions on how to do this can be found here. A blanket is intended for use on a bed. A blanket typically comes in cotton, wool and even a light down. 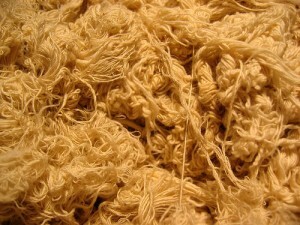 It is used for soft texture and added warmth, in addition to a decorative comforter. eHow Home indicates that a blanket’s sizing matches those of sheets. So a blanket will usually be sold in twin, full, queen or king sizes. Blankets are often crafted and sold for practical daily use rather than decoration. An afghan usually refers to a knitted or crocheted blanket. Wikipedia describes a true afghan as hand-made, either by piecing together squares of knitted or crocheted warn, or simply knitting or crocheting the entire piece. 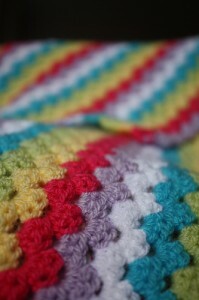 An afghan makes a beautiful and useful family heirloom, and cozy, cuddly baby blankets. Now that you are familiar with the terminology, you can find exactly what you need. If you need an extra layer of warmth on your bed, you can shop for a blanket. When you order a throw, you know that it will be small in size. And, when you knit a beautiful blanket for a friend, you are making an afghan. What’s your favorite material to relax with? August 16, 2012 | Posted by Lee C.
An important part of every night’s sleep is a good pillow. Having the correct pillow allows you to rest comfortably and prevents aches and pains in the neck and back. Everyone has different preferences about whether or not a pillow should be soft or firm, but there are a few other characteristics that need to be considered when purchasing a new pillow. Type of material, ease of care, allergy resistance, and resilience are just a few factors that need to be considered when purchasing a pillow. Cotton pillows are usually easy to machine wash and dry. They also are resistant to allergens. However, over time, they may lose their shape faster than other materials. If quick and easy care is important to you, cotton may be the best choice. One surprising pillow fill material is buckwheat. Buckwheat hulls offer a firm support and great air flow to prevent the build-up of heat against your head. Very few people are allergic to buckwheat and they usually do not attract dust mites. 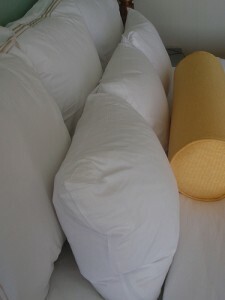 Another advantage to buckwheat pillows is that they are easily customizable. You can remove or add buckwheat hulls to create a pillow that matches your desired height and firmness. According PillowGuide.org buckwheat pillows can be placed in the freezer before going to sleep, offering warm climate sleepers added relief from the heat. Buckwheat is also very sustainable and eco-friendly. There is one downside to the buckwheat pillow; the shifting of the material may disturb the sleep of very light sleepers. If you waken easily, you may want to consider a different type of material. See this post for more about buckwheat pillows. Down and feather pillows are incredibly soft and fluffy. They also allow for good air flow and cooler temperatures around the head. Many people enjoy the comfort of a pillow made of soft down. Unfortunately, down pillows are often tough on people with allergies. Down feathers themselves are highly allergenic, as well as the dust mites they can attract. However, there are hypo-allergenic down pillows available. Another advantage to down pillows is their long life. Down seems to hold up better over time than other materials, according to Consumer Research. A wool pillow is another all-natural material that offers support and comfort. Wool wicks away moisture, which prevents bacteria and other allergen build-ups. It also offers temperature regulation around your head. No matter what type of filling you choose, be sure to choose a pillow that has the height and support that is right for the way you sleep. WebMD quotes Kammi Bernard, PT, a physical therapist at the Baylor Health Care System in Dallas, saying “The goal of using a pillow is to help keep your head in what is called a ‘neutral alignment,’ meaning your head is sitting squarely on your shoulders without bending back too far or reaching too far forward.” You will need to take into account whether you sleep on your side, back or stomach, and find a height of pillow that keeps your head in “neutral alignment” depending on your sleep position. When you find the perfect pillow, you will get an excellent night sleep, reduce neck and back pain, and avoid potential allergens. One selling point of sheets that is easily quantifiable is the thread count. It would seem to the consumer that the higher the thread count, the softer the sheets. Unfortunately, manufacturers of sheets take advantage of this assumption and often inflate the thread counts of sheets. According to TLC Home, in 2008, Bed Bath and Beyond was sued for misrepresenting thread count to consumers. Thread count is simply the number of threads it takes, both vertically and horizontally, to weave a square inch of fabric. The likely conclusion is that higher the thread count, the softer and more comfortable the fabric. However, if two or more threads are plied together to make a single strand, each ply can count as a thread. This inflates the thread count without creating a softer, more quality fabric, according to Home-Ec 101. Both TLC Home and Home-Ec 101 suggest that 180 is a soft thread count, 200-400 is softer and higher quality, and numbers like 1,000 are likely a higher price without any significant improvement in feel. So when buying sheets, what does create a higher value? 1) Organic cotton creates a higher price tag because it is much more difficult to grow than conventional cotton. Because organic cotton is grown without the use of harmful chemicals and pesticides, it is a healthy choice for bedding. 2) The type of thread and weave also creates higher value. According to Consumer Reports, Egyptian cotton and pima cotton have longer threads and will not pill as easily. 3) Cotton is a softer fabric, while a blended fabric of cotton and polyester tends to have a more crisp feel. 4) It is also important to make sure the sheets fit your bed. Consumer Reports indicates that many sheets they tested did not fit the advertised size of bed. It is necessary to measure your bed before you purchase sheets in order to be sure they will fit. You may have to order custom made sheets, but sheets that fit your bed are worth the cost. 5) And, of course, higher thread counts, to a point, do create more value. It is a good idea to be an informed consumer to get the best sheet at the best value. Don’t be fooled by inflated thread counts, or even feel of the sheet in the store, as it is likely to change as you wash your sheets. Know what kind of weave, and types of cotton or other materials best fit your needs. 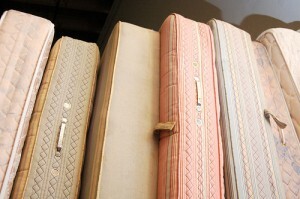 If you recently purchased a new mattress you may be having difficulty deciding how to get rid of your old mattress. They are bulky to carry and difficult to transport if you don’t have a truck. Most garbage removal services won’t take them if you put them out with the trash, or may charge you extra for removal. Instead of throwing your old mattress in a landfill, consider a few of these alternatives. If your mattress is clean and in good condition, you can donate it. While many charities no longer accept mattresses from the public due to sanitation issues, a few will. The most notable and prevalent is the Salvation Army. Many Salvation Army locations will even arrange for a pick up, solving the problem of carrying and transporting the mattress. Simply find a Salvation Army location near you and call to see if they are able to pick up the mattress. Not all locations will have this service available, but many will. Donation Town is another organization found online that will help you arrange a mattress pickup with a local charity. If you cannot find a local charity that will accept the mattress, check with local churches and food banks. They may know a family who is in need of a clean bed and the mattress can be given away, without the intermediary charity. You can also place an add on Craigslist or Freecycle and give it away to anyone willing to come pick it up. When purchasing your new mattress, have mattress removal in mind. Some mattress retailers will remove your old mattress for free or a small fee. If the mattress you want is sold in several locations, you may be able to bargain for free removal. Some retailers even say they will recycle the mattress, but you may want to follow up about where and how, to ensure that the mattress will be recycled. If your mattress is in poor condition, you may be able to recycle it. Begin by asking family, friends, neighbors, local homeless shelters, battered women’s shelters or a refugee resettlement program. You can also call your local recycling center or transfer station and see if they will recycle mattresses. August 9, 2012 | Posted by Lee C.
It can be difficult to choose colors when decorating your bedroom. There are many factors to consider such as matching the carpet, paint or wallpaper, as well as personal taste. 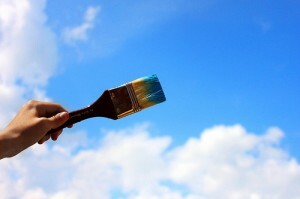 But, before you put up a new coat of paint, you may want to consider the psychological effects of the color you choose. There are a number of reasons the color blue might be a good color for a bedroom. Blue has a calming effect. Having light blues in your bedroom could physically calm your body and help relieve stress. This calm will help you associate your bedroom with relaxation, which in turn will help you sleep better. The color of your walls may help you have a better night of sleep and start the day more relaxed. Blue has another surprising effect. It can suppress the appetite. Color Matters points out that blue is the least common occurring color in natural foods. As a result, our bodies aren’t stimulated to eat when we see it. If you suffer from wanting to eat during the night, or waking to snack, you may want to consider using blue in your room. It is possible that when blue is the last color you see before you go to sleep, you will not feel the need for a midnight snack. Blue may be a wise choice for paint or other decor, such as a comforter, in your bedroom, but don’t go overboard painting your whole house blue. While it may keep you from gaining weight, too much blue can have negative effects as well, causing a person to feel cold, sad, or depressed. If you are feeling down, you may want to use some sunnier shades such as red or orange in other areas of the house. While choosing colors for your bedroom is often a matter of taste, it can also be a matter of emotional health as well. Be aware of how you react to specific colors and choose something that will help you be relaxed and rest well in that space. It is likely that blue has a calming effect, and will suppress your appetite, but there is potential to make you feel down as well. Consider using warm shades of blue that evoke images of the ocean or sky, rather than colder shades of blue. How do you respond to different colors? Have you ever painted or decorated a room according to how a specific color makes you feel? The emu is a large, flightless bird that resembles an ostrich and can run up to 40 mph. Standing nearly six feet tall, it can weigh more than 120 pounds. 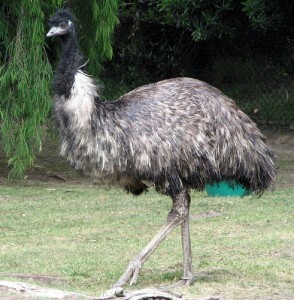 Native to Australia, the emu was first hunted by the Aborigines for its leather, meat and oil. The Aborigines used the oil for alleviation of arthritic symptoms and muscle aches as well as wound treatment and various skin conditions. Since that time, emu oil has been the subject of many studies that scientifically confirm the Aborigines were on to something. If properly refined, emu oil is hypoallergenic and completely safe. It can be taken as a supplement or used externally as a cream or rub. As a supplement, emu oil is used to regulate cholesterol levels, control blood sugar, boost energy, increase metabolism, strengthen the immune system and alleviate the symptoms of Crohn’s disease. It has even been reported to stimulate hair re-growth. When used externally, emu oil is able to deeply penetrate the skin. Having high levels of oleic and linoleic acid, it can ease pain in the muscles and joints and reduce the inflammation of eczema and psoriasis. Non-comedogenic (does not clog pores) and non-greasy with antiseptic properties, emu oil is also an effective acne treatment and wound healer as well as an excellent moisturizer for all skin types. Although Aborigines still hunt and use emus the way they used to hundreds of years ago, emu farming has become popular in recent years, and emu ranches can now be found in several countries, including the United States. Consequently, emu oil is very easy to obtain, but it must go through a stringent refinement process to minimize contamination. In America, emu oil should only be bought from ranches that carry the “Certified Fully Refined” seal of approval from the American Emu Association to ensure safety and effectiveness.